This Winter has been brutally cold where we are and with that has come lots of sickness. Rosie and Jewel have had a runny nose for months it feels, and there have been more severe sicknesses mixed in. If your kids have been sick even half as much as mine these sick kid tips will surely come in handy. 1. When your child is stuffed up and congested lather their feet in Vicks Vapor Rub (affiliate link), and then put socks on their feet. Within minutes they will be breathing better and ready for rest. This really works! 2. Is your child sick with a stomach bug? Keep dollar store table cloths or shower liners on hand for these times. Drape one over your child's sheets or over the couch before they lay down. That way if they get sick you can just roll the tablecloth up, toss it in the trash, and put another one down. This tip has saved me from having to clean up vomit several times. 4. Does your child have diarrhea? Are they vomiting? Don't forget to put them on the B.R.A.T diet. Only let them eat bananas, rice, apples, and toast until the diarrhea/vomiting starts to go away. 5. Does your child have a sore throat? Mix hot water with a bit of honey and have them sip it. This simple concoction soothes the throat, helps clear nasal passages, and kids really enjoy drinking it. 6. Does your child have the chills? Pop their blankets in the dryer for a few minutes just before bed. They will love it! 7. Double and triple sheet the bed. This simple tip has saved me massive time at night. Double sheeting the bed is great for when you have babies who may spit up or over wet their diaper and for when kids are sick. If the top sheet gets soiled in any way simply remove it, and the bed is ready to go. For all the best kid pins follow Growing a Jeweled Rose on Pinterest. 8. Is your little one fighting to get their medicine down? Try a spoonful of sugar. Mary Poppins taught us this little trick long ago, and it is one that really works! Some medicines taste so awful it is no wonder they fight taking them. 9. For kids with upset tummies give them Ginger-ale at room temperature. Cold beverages tend to upset tiny tummies so be sure to serve it at room temp. Also don't forget to give kids tiny amounts of fluids frequently rather than a lot at once. Too much at once will make them get sick again. 10. Popsicles are great for when kids are sick. They soothe sore throats and slowly get fluid into a child's body, which is great for when they are having trouble holding down food. Besides that, kids LOVE them! 11. Put away the blankets and pull out the towels. If your child is actively getting sick give them large beach towels to use as blankets. You can fit more in a load of laundry, and they are more absorbent and make cleaning up any mess a little easier. Many of our beach towels also have fun characters on them which my girls like. 12. Cover the floor with towels. There is little I hate more than cleaning up vomit. If you surround the floor near where your child is laying with towels you can save yourself from having to scrub grossness out of carpets or from the floor. Toss the towels in the laundry and voila! 13. Having trouble bringing your child's fever down? Try rotating between children's Tylenol and Motrin every four to six hours. For some reason rotating between the two meds always seems to do the trick with my kids. 14. If your child does get sick on the carpet or furniture here are great tips for cleaning up vomit and getting rid of the smell. 15. Are you vomit sensitive? I am. One whiff of that stench is enough to send me hurling towards the toilet. When my kids or husband is vomiting a handkerchief with a few drops of my favorite essential oil tied loosely around my nose just below my eyes helps to keep me from getting sick. I hate throwing up and would choose to wear the hanky any day. 16. Eucalyptus essential oil is a go-to anytime my girls are sick. We have found all sorts of ways to add eucalyptus into fun activities. You can also add a bit to the bath. Eucalyptus opens up the airways and helps clear congestion. SO HELPFUL, especially just before bed! 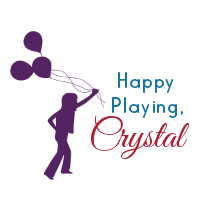 To see all of our eucalyptus activities go here. 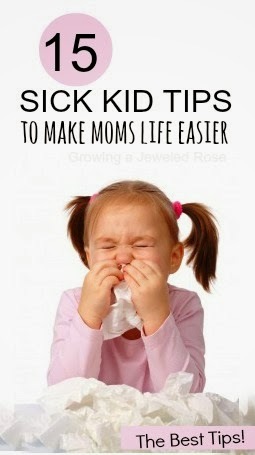 I hope you find these sick kid tips helpful and that your little ones feel better ASAP!